She would have frequent break outs on her face (as in the photo below) which the allergist told us was a significant form of eczema and recommended a very potent cream (which was soon recalled from the market). He also told us that, based on generalized inflammation but no positives on her allergy skin test, he felt she had some form of inflammation throughout her body. Her facial eczema was so bad that it would alarm people we met and they would ask if she had something contagious. She would complain that her eyes hurt daily, and she would rub them and cry. 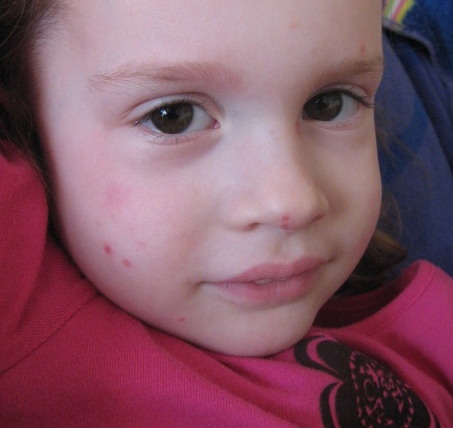 She had intermittent episodes of red splotches on her face, ears and neck and intense itching as well as a general redness to her cheeks that seemed chronic. She had deep red circles under her eyes a lot of the time. She was unhappy so much of the day and even nicknamed herself “The Mad Queen.” Her growth had nearly stopped — she was such a little thing: short little legs, wearing baby sizes instead of toddler sized clothing and always had such a round belly. I had asked a specialist about the possibility of gluten being an issue, and he laughed, saying gluten issues were “an Internet fad” and sent me on my way. But looking at my tired, sickly looking child laying on the couch every day, I knew something was very wrong with her. I started keeping a journal of everything she ate and her behavior every day. One of the first things we realized is that she got itchy after eating anything with food coloring. So we eliminated food coloring by buying all organic fruit and juices and scrutinizing all labels for dyes. This cleared up the chronic redness she had to her cheeks. Next we eliminated gluten from her diet. Within a few days we noticed a difference in her, and after several weeks we were positive gluten had been an issue for her. It was amazing to watch the changes in her. Her appetite increased astonishingly, her belly slimmed down, her skin cleared up, her eyes didn’t hurt her any more, she had energy to run just like you would expect a kid to do, and she was happier. She started sleeping all the way through the night. 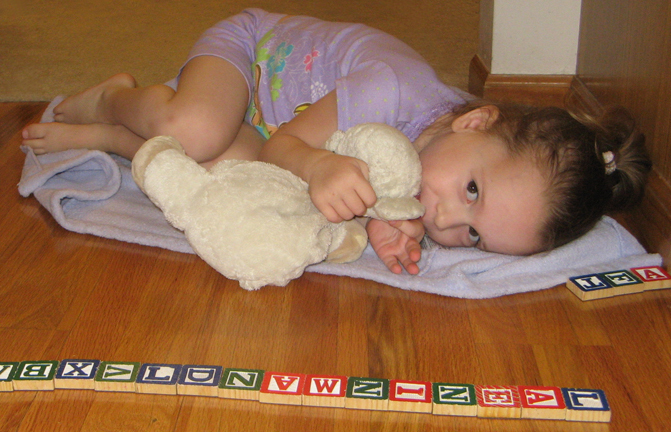 Since she used to spend so much time laying on the couch, sucking her thumb for comfort and snuggling with her Lambie, we knew we had hit a milestone of progress when she was so active during the day that we had to go hunting for Lambie at bedtime because Lambie got set down somewhere and forgotten. Now she calls herself “Miss Sunshine” because she is so cheerful and smiles so much. When she was 3 years old, she was wearing clothes sized for a 24 month old. Now, at age 5, after two years of being gluten free, she is in a size 6. She is as tall or taller than kids her age, and family and friends continue to comment on how remarkable the changes in her are. One family member said that because she was so small for her age a while back with shorter legs they thought she was going to be shorter as an adult. But because Madelyn has grown so amazingly and has long legs and height to her now (see photo below) this family member now thinks she will be tall like her siblings. Our pediatric gastroenterologist told us, even though Madelyn tested negative for celiac disease on her blood test, that gluten intolerance can make someone just as sick as someone with celiac disease. She said to consider Madelyn as our report card, that what we changed in her diet was benefiting her so much that we should keep doing it for her health. We did eventually also eliminate milk protein from her diet, even though she had such a dramatic improvement off gluten, we could tell that there was something else in her diet that seemed to still get to her now and then. Today she is the picture of health — I can watch her run and play with seemingly endless energy. 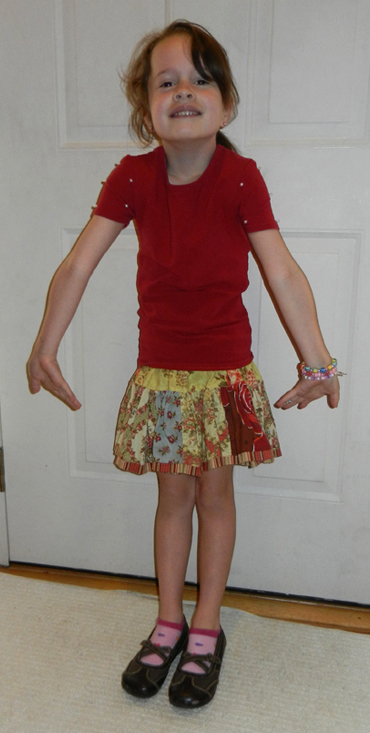 She loves kindergarten, plays soccer and takes tap and ballet lessons. She is agreeable, radiant and happy. She is a good advocate for herself at school, too. At 3 years old she questioned her dance teacher about snacks being gluten free and at 4 years old in preschool she impressed her teachers by making sure she was getting gluten and casein free snacks and handing back to them anything she was accidentally given. We always try to turn the focus from what she can’t eat to instead how we can make something safe for her to eat, and we spend lots of time in the kitchen making yummy creations that please not only her, but the non-GF members of the family and even neighbors and kids over for playdates. We may have given up gluten and dairy and food coloring, but we have gained something priceless … a very healthy girl with abundant energy and lots of smiles. Please note: This Mom is not a medical expert, nor am I. If you suspect your child is having issues with food, please begin by getting him or her appropriately tested for celiac disease and food allergies. But if your child is still having troubles even after all these tests have come back negative, it might be time to start thinking about trying food diaries and food eliminations. If you’d like to read about my daughter’s similar experience, click here. More stories: Are you a parent of a child with celiac disease or another form of gluten intolerance? Feel free to share your story with us (and before and after photos if possible) about your child’s symptoms, how he or she was diagnosed and what life is like for them now. Just email me at kachalmers2@gmail.com. Thanks!